What Is The Best Shampoo For Horses On The Market In 2019? What Is The Best Shampoo For Horses On The Market? Regular horse care involves a number of important steps and requires a lot of tools. Curry comb, dandy brush, mane comb, equine clippers, you name it. We all also know how hard it can be to keep a horse clean, especially if you have a mud monster. Even if your horse doesn’t like to roll in muddy puddles, you may wish to bathe them from time to time to remove the everyday stains, dust and oily residue from the coat. If you are looking for a really good shampoo suitable for frequent use, you may find yourself overwhelmed with the huge selection of shampoos available. A great cleansing shampoo, this formulation leaves the horse’s coat soft and smooth – and squeaky clean. Using lanolin to add extra softness, this shampoo is gentle enough to be used daily, as well as being tough on stains and the heavier-soiled horse. All you need to do is dilute it slightly less for the more stubborn stains, and you will be rewarded with a spotlessly clean coat. No leftover residue – When you use some shampoos you can be left with a dull look to the coat caused by leftover suds or components in the shampoo. Corona leaves no residue, ensuring the shiniest horse on the yard. Lanolin protein enriched – The addition of lanolin not only softens the coat but can actually help strengthen it as well. Great value for money – The concentrated formula allows up to 400 washes, meaning you get a lot of bang for your buck! Highly rated – This shampoo has been voted as the best shampoo by the Horse Journal, so you will be in good company if you choose this one. Can leak in transport – The only reported problem with this shampoo is the packaging. Sometimes it arrives with a leak, which could be solved by the manufacturer stating that the package contains a liquid. If yours has arrived with a leak it shouldn’t be difficult to get your money back or a replacement. If you are looking for a great cleansing shampoo which can even lift the stains from a white coat, then this is the one for you. It’s not only great at cleaning and great value for money, it is also very nourishing for your horse’s coat. As an added bonus, it won’t irritate the eyes if you happen to get a drop or two splashed in one of them. For those looking for a natural, plant-based shampoo, Warhorse is the one for you. Using a base of Castile soap with added Coconut, Castor, Avocado, Almond and Sunflower oils, this is an effective cleanser with absolutely no artificial ingredients or harmful chemicals, making it suitable for sensitive skins. Free from sulphates, parabens and dyes – This truly is the most gentle shampoo out there. It will work well on all types of skin, even the most sensitive ones that react to other products. Smells delicious! – Using only natural essential oils for fragrance, this shampoo not only works as a cleanser but smells heavenly, meaning your horse will too. Cleans and conditions all in one – No need to use a separate conditioner to soften the hair after you wash; the all in one formula does everything you need all in one go. This is great for horses that aren’t keen on being bathed so need to get it all done as quickly as possible. Rinses easily – This shampoo doesn’t create a huge lather, making it easier to wash it all off. Can leave a residue – There is a chance that your horse’s coat may retain a few suds, leaving a slightly sticky residue which can attract dust. For a really natural product that not only works and smells great but is also good for the environment and your horse’s coat, look no further. Warhorse is a natural formula which is as gentle as it can be, even on dry and itchy skin. 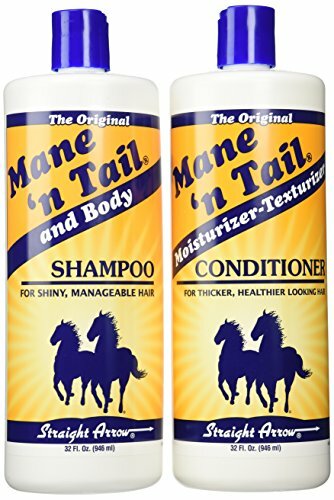 A good all round shampoo and conditioner combo, Mane ‘N Tail have really cornered the market. For the horse who needs more than just the shampoo for cleaning but the conditioner for softening too, Mane ‘N Tail is the one to go for. Ideal for regular use – Using this product often can actually improve the appearance of the hair, making it appear thicker and more lustrous. Good for skin issues – This shampoo is ideal for those with sensitive skin or allergies. It can be used frequently, unlike some shampoos which actually cause dry, itchy skin. A little goes a long way – You don’t need to cover your horse with pints of this stuff to get a good clean. Just a few squirts should give enough lather for a really good clean (unless you’re washing an enormous Shire, in which case you might need a little more!) This makes it great value for money. Can be used for people as well as horses – That’s right, if you’re envious of how great your horse’s hair is, you can use it on your own to get the same great results! Can make hair limp – Some users have said that this product can sometimes make hair less thick and glossy than it claims to do. This a good, no nonsense shampoo and conditioner combo, ideal for those horses who benefit from regular washing and who like being pampered so will happily stand for a shampoo and a condition. It has a pleasant smell and does what it says on the tin. 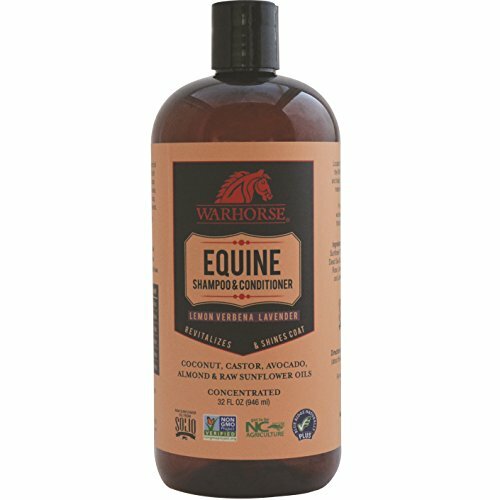 Looking for what is the best shampoo for horses? Look no further! 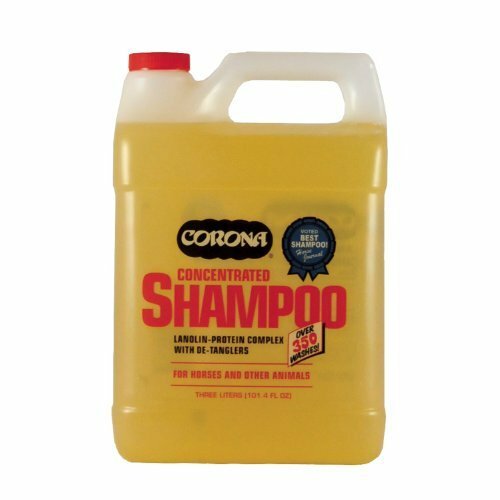 For a luxury, lanolin-filled clean that leaves the whites white and the darks glossy, Corona Shampoo is your answer. For those looking for an all natural, highly effective product, Warhorse Solutions Natural Equine Shampoo is what you are after for an all in one clean. For a good, simple, value for money shampoo and conditioner, choose Mane ‘N Tail Combo Deal Shampoo and Conditioner.